Samsung wrote to HEXUS yesterday evening announcing that it has launched the Samsung Galaxy Tab S4, and to share UK pricing with us. You can find and overview of the new tablet from Samsung on its official news site and the official product page is available now too. The key features the new Samsung Galaxy Tab S4 brings to the table are; Samsung DeX, a longer-lasting battery, and the refined S Pen - but there are other niceties too, as you will find out if you read on. The new tablet is described by Samsung as a 2-in-1 Android tablet and with the use cases highlighted, and the pricing, it looks like Samsung has changed focus to aim at would be Apple iPad Pro or Microsoft Surface purchasers. Productivity enabled by the new tablet is a highlighted theme in the press release, promotional material and YouTube feature video of the Galaxy Tab S4. Samsung DeX arrives in tablets for the first time. 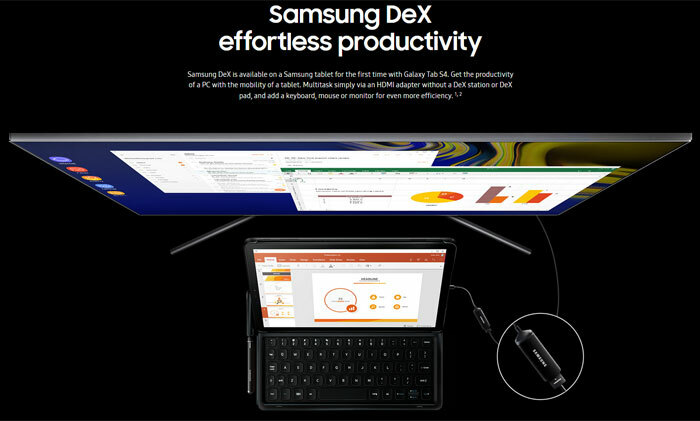 When connected to the optional Book Cover Keyboard (sold separately) or launched from the Quick Panel, the Galaxy Tab S4 powers on Samsung DeX, providing a familiar multi-windowed desktop experience. You can even use Microsoft Office in this mode with drag and drop between Android apps and keyboard shortcuts and commands. If you connect to an external screen to extend DeX (optional compatible HDMI to USB-C multi-port adapter required), the tablet can act as a sketch pad of fully functional Android tablet for multi-screen multi-tasking. The new Super AMOLED screen sounds rather an attractive feature of the Samsung Galaxy Tab S4. It is a larger screen than previously, with a higher WQXGA resolution. It does indeed make the tablet larger than its predecessor (it is heavier too) but the screen-to-body ratio is up 5 per cent to 79 per cent. The screen's vivid colours partnered with four speakers, tuned by AKG and Dolby Atmos immersive sound technology, will bring entertainment to life, says Samsung. If you are a fan of the S Pen on the Galaxy Note smartphones you might be glad to hear that the enhanced S Pen with the Galaxy Tab S4 takes some useful tricks to the tablet form factor. You can use the stylus to navigate, translate and organize notes through Samsung Notes, and even send personalised texts through Samsung Live Message. Another useful feature is the Screen-off Memo for quick notes and lists. If you already own or have some experience of the Galaxy Tab S3 you might be interested in this side-by-side comparison and infographic from Samsung. Key changes are the aforementioned screen with greater size and resolution, though the new tablet is taller, thicker and heavier. Elsewhere owners of the Tab S4 will benefit from an SD835 octa-core rather than quad-core processor, longer lasting battery (up to 16hrs rather than 12hrs video playback), the newest Android OS, faster LTE (LTE is optional). A quick search reveals that the Samsung Galaxy Tab S3 can be bought for approx £350 at many stores in the UK. However, Samsung has ambitiously priced the new Galaxy Tab S4 starting from £599 for the Wi-Fi model, £649 for the LTE model, and you need to add £119 for the custom keyboard case. The base models come with 64GB of built-in storage, and there will be a 256GB version. Whichever you choose, you can add up to 400GB via microSD card. Its a nice product, I get why they made it and what they are going for…but its just way too expensive. At £600 its the same price as the M3 surface pro (which is an equivalent spec), and then you have a genuine productivity machine rather than a glorified tablet. It will sell for the same reason as the iPad pro sells - marketing and branding. I can not see technical reason why most people would ever buy an iPad pro or this Tab S4 over a surface (or one of the surface competitors)…if your main reason is for productivity/working etc when they are all an equivalent price. If you don't need all the functionality that a surface type device provides (i.e…windows) then why not just buy a normal iPad or tablet for half the price? Only reason I can see is because you like the brand or are sold by their marketing. Agree with the above, the problem (for consumers) is Apple and Samsung have managed to win over a lot of sheep into blindly buying whatever they release regardless of actual need or better alternatives. Trying to explain to my brother in law why I don't yet want to replace my old HTC for the latest Samsung and that there are better things I could spend my money on, is well, like banging my head against a wall. Have a Samsung S2 8“ tablet and its been rock solid though no update to Andoid O as of yet (and probably not likely). 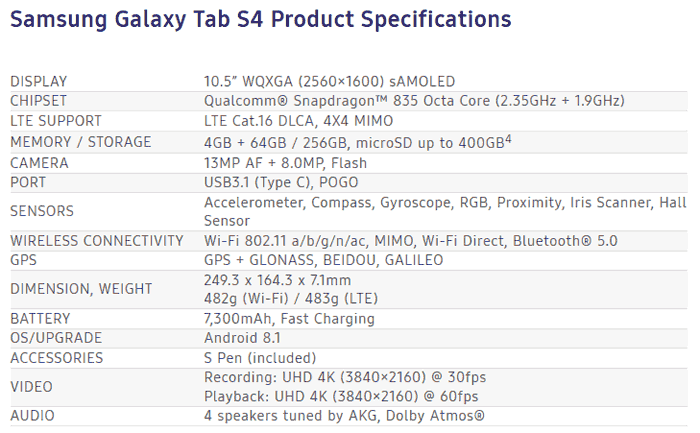 I would like a larger (10”) tablet (do not want an iPad) and have been waiting on this (S4). at £718 with the keyboard case its a non starter, particularly as i assume thats for the 64GB model. For £708.98 i can get the Surface Go 128GB ssd, 8GB ram model, the surface pen and the surface keyboard and thats way to expensive. For now looks like an upgrade is out of question.